It shows up in this week’s Gospel reading. A man comes to Jesus asking, “Good Teacher, what must I do to inherit eternal life?” (Mk. 10:17). Jesus tells him what the tradition expects: obey the commandments. Surprisingly, the man says that he has been obeying all of the commandments since he was a kid. 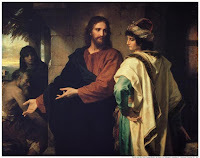 Then Jesus, in the words of Mark, “looking upon him loved him, and said to him, ‘You lack one thing; go, sell what you have, and give to the poor, and you will have treasure in heaven; and come, follow me.’ At that saying his countenance fell, and he went away sorrowful; for he had great possessions” (Mk 10:21-22). What an interesting old phrase – his countenance fell. His countenance became sorrowful. A person’s countenance usually means the person’s face but in this story it sounds as if it also refers to his whole posture. He excitedly goes to talk to Jesus, the same Jesus whom Mark says loved the young man. But after his conversation, his countenance fell. His shoulders slumped, he hung his head down, his face was saddened. I suppose that might cause a lot of us to have our countenances fall, for we too have great possessions. When we discover that discipleship has to do with our money, our shoulders sag, our faces drop, and maybe like that 4-year-old-boy, we want to hide under the chair. This passage is among the best-known stories in the Gospels and among the hardest to preach. Many of us pastors stand up every Sunday in front of a congregation full of men and women in their Sunday best, bright countenances, with great possessions. They’re making payments on two or three cars, a house, a boat, a lake house, three or four TVs, two or three computers, cell phones, the cost of eating out five or six or ten times a week, a membership at the gym, a couple or more club memberships, health insurance, car insurance, house insurance, life insurance, and when Sunday rolls around they generously put a $20 bill into the plate. They are moral in their personal conduct, work hard, and occasionally volunteer for Vacation Bible School. So for us to stand up in the pulpit and announce that their very possessions are in the way of following Jesus is to risk not only that their countenances will fall but that they will not put that $20 in the plate and not volunteer for next year’s Vacation Bible School. We’re having a hard enough time paying the church bills and getting volunteers as it is; the last thing we want to do is run everyone off. Maybe Jesus could afford to run off potential disciples; he didn’t have a budget to keep, salaries to pay, and a building program on the drawing board. He didn’t even have a place to lay his head – no mortgages and no car payments; no TV’s, no cell phones and no insurance. Jesus was not possessed by possessions, as the man was, as we are and our churches are. The man held so tightly to his stuff, and the stuff had him so deeply enmeshed, that he couldn’t let go and grab what Jesus was offering him. Verse 21 says Jesus loved him. What if Jesus was not adding to the man’s burdens but offering him (and us) a loving and gracious invitation to new life?